Logo Design identifies your business or your brand. It can be a simple flag, a signature, or even a street sign. A good logo design is distinctive, appropriate, and practical. It is graphic and simple in form. The right logo design is an important investment in your business. 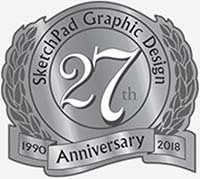 Let SketchPad Graphic Design create for you a good logo design that is just right for your business or your organization.